THERE are indications of panic in the anti-blog newsrooms. Despite their efforts to liken the Fiji dictatorship to the military dictatorship in Burma, there have been no protest marches or public immolestations. Ordinary Fijians seem to be going about their daily lives in normal ways. From the perspective of the anti-blogs, things are moving too smoothly. The Constitution reform process has been generally well received. The media is publishing commments hostile to the "illegal" government by former politicians Qarase, Chaudhry and Beddoes , and even Rabuka has put his two-cents' worth in. The Methodist Church hierachy and the CCF have aired views critrical of government on the demise of the Great Council of Chiefs. The pathway to the "illegal" elections is now more clearly illuminated. There seems little doubt that the United States - and Australia and NZ behind the scenes - have accepted the announced steps leading up to the 2014 election. And even the economy seems to be picking up. What does this mean for the anti-blogs? They could change tack and try to steer events closer to how they wish. They could even change to genuine support, subject to certain conditions. But these strategies would not put the SDL back in power or ensure itaukei paramountcy, whatever that now means. Nor would there be the perks, appointments and scholarships like there were in the good old days. So, as their chances of success diminish by the day, their best option is to take their disinformation to a new level. "Disinformation (a direct translation of Russian дезинформация dezinformatsiya)", and I quote from Wikipedia,"is intentionally false or inaccurate information that is spread deliberately. For this reason, it is synonymous with and sometimes called black propaganda. It is an act of deception and false statements to convince someone of untruth. Disinformation should not be confused with misinformation, information that is unintentionally false. "Unlike traditional propaganda techniques designed to engage emotional support, disinformation is designed to manipulate the audience at the rational level by either discrediting conflicting information or supporting false conclusions. A common disinformation tactic is to mix some truth and observation with false conclusions and lies, or to reveal part of the truth while presenting it as the whole (a limited hangout)." 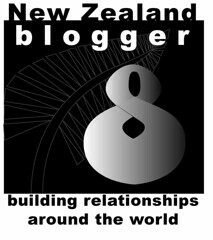 The blog's latest posting (22/3/12) claims "on excellent authority that a trio [of the Chief Justice and lawyer sisters Nazhat and Shaista Shameem] has already drafted a guiding Constitution and held a secret meeting on New Years Day at the Macau Hotel in Nadi" to discuss the consultation process, the Civic Education Programme, and the composition of the Constituent Assembly. They also had learned "on excellent authority that as suspected, Yash Ghai was chosen by Bainimarama and Khaiyum to head their illegal consultation process because of his profile." What's so hushhush and sinister about all this? A secret meeting in Nadi when they could have met more secretly in Suva — although, apparently, it took Coup4.5 from New Year's Day to find out? Three lawyers meeting to consider legal guidelines? Thoughts on who could make up the Constituent Assembly? The choice of an internationally respected lawyer to chair the Commission that would hear submissions prior to the meeting of the Assembly? Does Coup4.5 seriously and honestly think the Constitution Process could happen without forward planning, that participants and agendas would miraculously fall into place, and a lot should be drawn for chairman? There is no story here. Perhaps that's why it took Coup4.5 from January 1 to tell it. The day before (21/3/12) they published an equally incredulous, but far more embellished, story. This time it was a "leaked report" of a meeting of the Military Council to provide an "exit strategy for Frank Bainimarama cloaked in a new Constitution and the 2014 election." The meeting apparently considered a "paper titled Fiji's Road Map To Political Election 2014 (sent to Coupfourpointfive the day before the consultation process was announced more than two weeks ago on March 9)." But why it was not reported then they do not say. However, we are told subsequent events (the abolition of the GCC, changes in the Provincial Councils, etc) make the report "too convincing to ignore." The meeting also discussed how Bainimarama could be "out maneuvered" [sic]! Huh! Exit strategy and outmanoeuvred? Submitting the report and the minutes of their meeting to paper would seem to be dangerous given their part of their plot to outmanoeuvre the Prime Minister. The paper (that may be read in full on the Coup4.5 site) really lets the cat out of the blog so I would expect the immediate dismissal of plotters Captain Natuva, Colonel Saumatua and Colonel Aziz on the grounds of disloyalty. The paper listed seven strategies. Strategy 1 called for an immediate election, and a “People Constitution Forum" spearheaded by the 20 government departments. If this does not happen, Coup4.5's disinformation is exposed. Strategy 2 called for the PM "to publicly announce this month he will stand for election" and form a new political party. His campaign will be led by "highly professional and political experts." All government departments will be "militarised" and soldiers will be his "campaign runners." Provincial Councils and civil servants will "follow orders." It's no secret the PM may stand for elections but if his election campaign is not as Coup4.5 describes, its disinformation is further exposed. Stategy 3 would see no old political party stand for election, and a qualification test for all candidates. This is also possible. It has been talked about for some time, and no one would be surprised if the Constitution Assembly ruled along these lines. I'll leave readers to read the rest, most of which I find unsurprising. Most "accusations" have been announced or anticipated already. It is only their interpretation that makes them seem sinister. But, as we now all know, "A common disinformation tactic is to mix some truth and observation with false conclusions and lies, or to reveal part of the truth while presenting it as the whole." Expect much more of the same as time rolls on. Retired professor emeritus Crosbie Walsh was founding director of development studies at the University of the South Pacific and publishes a Fiji analysis blog. The death of King George Tupou V was unexpected for all – especially for family and close friends. Neil Underhill is an Honorary Correspondent for the British government to King Tupou V. He is also a close personal friend. Born in Fiji, he has lived most of his life there and frequently travels to Tonga to see the King. He strongly disagrees with those who describe “HM” as eccentric and instead remembers him as a man of “impeccable dignity”. Fiji Sun March 14 front page. GRUBSHEET'S burgeoning number of opinion pieces on Fiji are largely designed to counter what we regard as the continuing failure of the mainstream regional media to come to grips with the reality of events there. They’re especially aimed at an Australian audience, to highlight what we regard as the folly of Canberra having turned its back on Fiji since Frank Bainimarama’s coup five years ago. A lot of these pieces are picked up by the mainstream media – The Australian and Sydney’s Daily Telegraph, for instance – or disseminated to a wider regional and global audience through the Pacific Scoop service of the Auckland University of Technology and Pacific Islands Report from the East-West Centre in Hawaii. 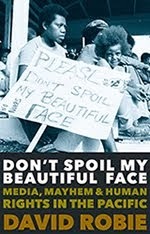 Some are written as news stories but most are shamelessly opinionated, strong expressions of our own views based not only on on a life-long association with Fiji but having reported political events there for the mainstream media since before the first coup in 1987. The problem arises when these articles are picked up and republished in Fiji, a country where the separation of news and opinion in the mainstream media doesn’t have a strong tradition. And so it was last week, when the Fiji Sun published a Grubsheet opinion posting on its front page that would have looked very much like news to local eyes. 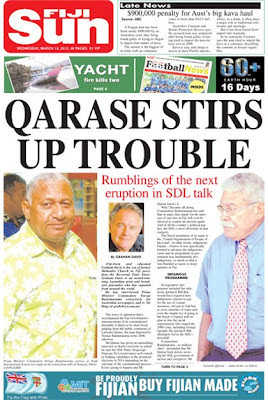 It provoked a wave of outrage, not least from the subject of that article – Laisenia Qarase, the man Frank Bainimarama deposed in his 2006 coup. As readers can see for themselves in our own comments section, Qarase has gone on the attack against Grubsheet, accusing us of distortion, disregarding the facts and attempting to “crucify” him and his party – the SDL. He’s particularly aggrieved that we’ve accused him of pursuing racist policies in government. As readers can also note for themselves, we stand by that accusation. But we can also sympathise with Qarase that an article on a humble Australian blog site can so dramatically become part of the domestic political debate in Fiji. If any proof were needed of the power of the internet to amplify the smallest voice, then this is it. 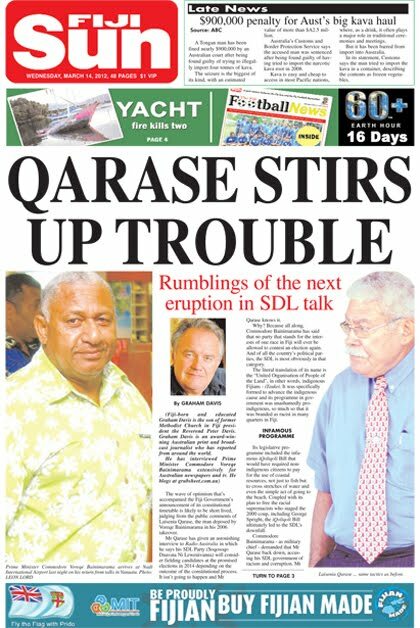 Qarase is not only entitled to defend himself but Grubsheet is delighted that he can now do so fully in the Fiji media for the first time in a long time. The Bainimarama government has lifted censorship and a full-blown debate has erupted about the impending discussions on a new constitution and the unilateral abolition of the Great Council of Chiefs. This is how it should be. It’s also Grubsheet’s view that if Laisenia Qarase intends to stand in the promised elections in 2014, his record in government is also a legitimate subject for debate. Against all evidence to the contrary, he’s now running the line that the SDL has always been a "multiracial party", didn’t disadvantage other citizens in government and that he’s never believed in indigenous paramountcy. Every village pig in Fiji has suddenly sprouted wings and set off over a moonlit lagoon. But again, Qarase is entitled to put his case. And we’re entitled to put ours. Read the attacks and response on the Grubsheet blog. For Laisenia Qarase, the real enemy isn’t Grubsheet. The real enemy is the cancer of intimidation and racism in his own ranks. A clip from the documentary Alkinemokiye. THE VOICES of local workers in the world’s largest gold and copper mine controlled by the US-based mining giant Freeport McMoRan in West Papua can be heard loud and clear in a new documentary that chronicles the biggest strike in the company’s history. Alkinemokiye is the latest feature documentary from filmmaker Dandhy Dwi Laksono. It captures the fight of 8000 workers for increased wages in what is believed to be the longest and most widely joined strike since the mining company began operations in Indonesia in 1967. 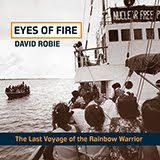 IN THE first extensive interview with Fiji regime leader Voreqe Bainimarama for the past 18 months or so, Fiji-born Australian journalist Graham Davis gives some insights into the commodore's current thinking. Davis highlights the US "open arms" policy in contrast to the Australian and NZ "isolationist" policy towards Fiji. Bainimarama also condemns the "neglect of the Pacific" by Canberra and Wellington in the 25min interview broadcast today on Sky News.